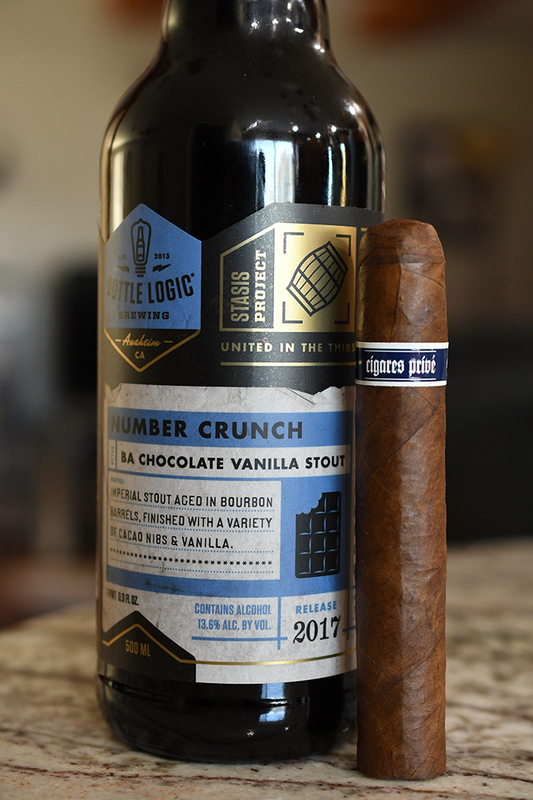 El Paso is seeing a beak in the 20 degree weather with a gorgeous 70 degree, sunny day and I intend to take full advantage of it by heading out back with a Illusione Cigares Prive paired with a bottle of Bottle Logic’s Number crunch. The Cigares Prive line used to be a limited production run that Illusione had converted over to a full-production line last year. The line comes with two different wrapper variations, Corojo and Mexican San Andres. Today we focus on the Corojo. Produced at the Tabacos Valle de Jalapa S.A. (TABSA) in Nicaragua the cigars starts with a Corojo wrapper, Nicaraguan binder and Nicaraguan filler. 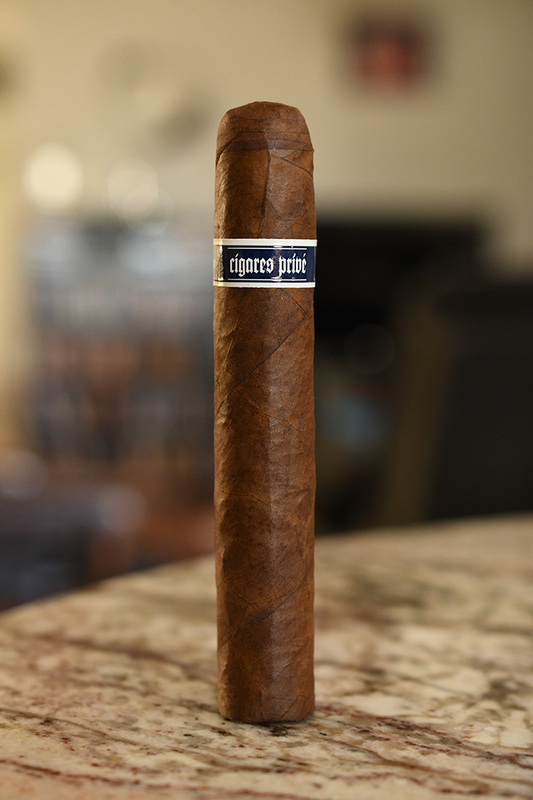 The Cigares Prive comes in 3 different sizes: Robusto (5 x 52), Prensado Suave (5 1/2 x 56), and the Presado 660 (6 x 60). Each format comes packaged in boxes of 25 and run between $7.90 and $8.90 a stick. Big thanks for Fox Cigar Bar for sending a few of these my way. You can order them directly from them here. 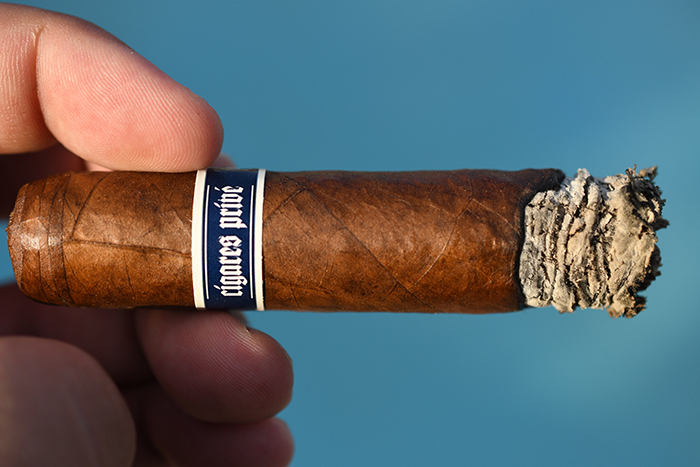 The Illusione Cigares Prive starts out with a very worn, rustic looking, beautiful wrapper. I say beautiful cause I love it when cigars look natural. The wrapper features a medium brown color with some scattered splotches of darker brown areas along with some orangish areas mixed it. 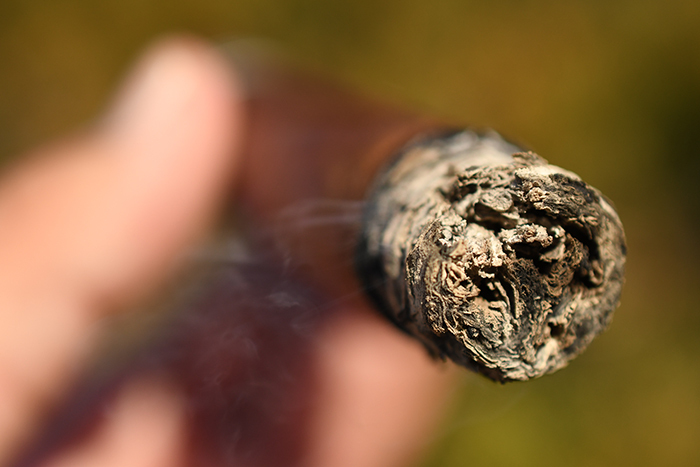 The texture is semi-toothy with a good amount of oil and some medium-sized veins running through the cigar’s body leading up to the round triple-wrapped cap. 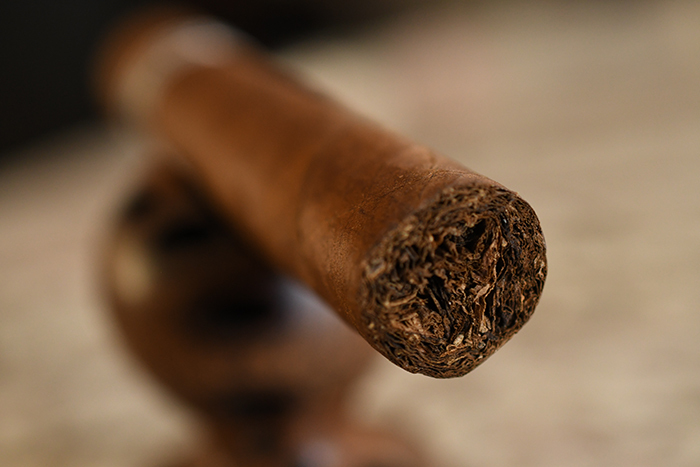 The cigar is firm and the only soft areas are located around the foot of the cigar. 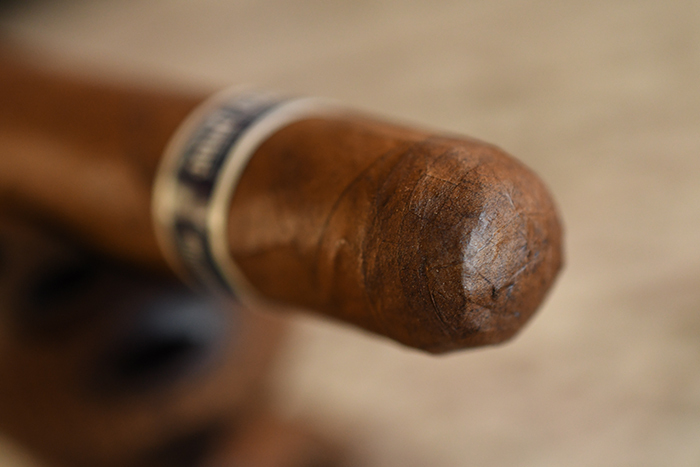 The cigar is polished off with a dark blue version of Illusione’s beautifully elegant bands which simply states “Cigares Prive” across the front in white. 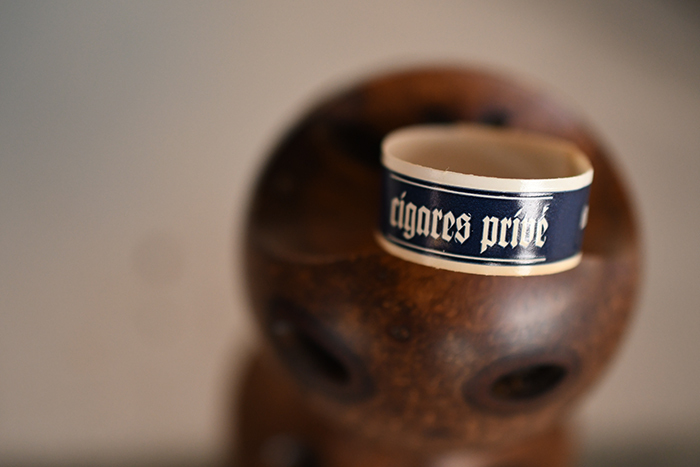 The wrapper on the Cigares Prive gives off some bold spice and natural tobacco aromas while the foot carries more mossy, sweet aromas. The cap cut clean and easily using my Palio double bladder cutter. The cold draw produces lots of spice, sweetness, cocoa, and natural tobacco. 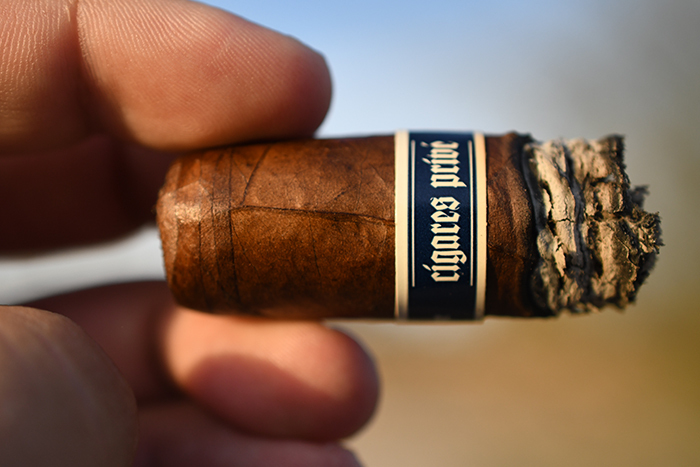 The Illusione Cigares Prive starts out with a quick blast of black pepper which quickly fades to release bold spice, cocoa, vanilla, oak, and a bit of moss/dirt on the tail end of the taste. The cigar is starting out fantastically. The draw is effortless and releases a great amount of thick, white smoke which each puff. The burn line is a bit wavy, but not too concerning as it leaves behind a trail of compacted white and dark gray ash which held for about 3/4 of a inch before falling off. 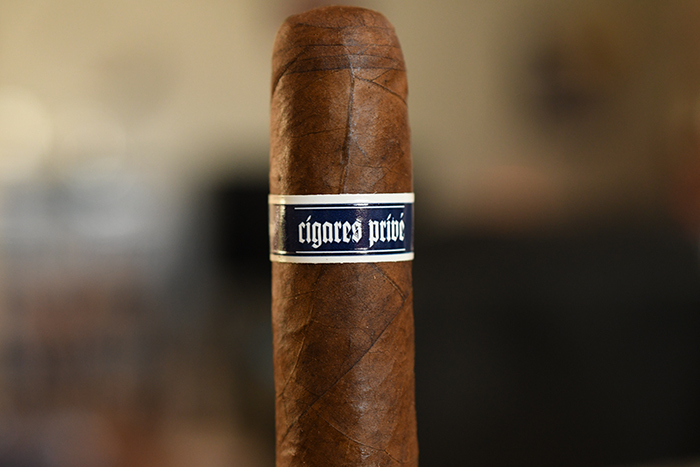 Into the second third of the Illusione Cigares Prive and an interesting pine flavor has really come on in the flavor profile backed by the bold spice, cocoa and vanilla with some light oak and natural mossy flavors. The retrohale brings out a lot of the pepper that I haven’t really been picking up in the experience. I close out the second third with nothing really in terms of nicotine. Into the final third of the Illusione Cigars Prive and the flavors have changed up quite a bit. The main flavor is now the oak and a mixture of oaty/grain with a good amount of vanilla and pine backed by soft cocoa, a bit of light coffee and spice. It took me almost two hours to take this cigar down to the nub and I’m surprised with how slow it burned. I experienced no harshness, nor any extended heat and only a little bit of nicotine. Again, I am a big Illusione fan and I absolutely loved the Cigares Prive. The flavor profile is complex, bold, and extremely enjoyable while the construction was flawless. Add in the ease of finding these and the low cost per cigar and it’s easy to see why these will find their way into my everyday rotation. This was probably one of the more full-bodied cigars I have had in their portfolio and I am still amazed with just how smooth it went down. Number Crunch is a Bourbon Barrel aged Imperial stout finished with a variety of cacao nibs and vanilla brewed at the Bottle Logic brewery in Anaheim, California. Coming in at a whopping 13.6% ABV this beer packs a punch. The beer starts out very sweet with a whole ton of chocolate and vanilla. It almost tastes like ice cream. It’s sticky with very heavy bourbon notes, caramel, and roasted malt with a heavy mouthfeel before finishing even sweeter with more cocoa and vanilla pouring on. The alcohol is completely hidden in this beer. The vanilla and cocoa is what drew my attention to this pairing as the Cigares Prive are heavy on both flavors as well. The beer is BOLD and will overpower most cigars but the Cigares Prive really held its own and never once got overpowered by the body of the beer.